Do you see yourself as just and loyal, patient and true, and unafraid of toil? Well, if so then you probably already know exactly where The Sorting Hat would place you once you get your acceptance letter from Hogwarts. Hufflepuff! 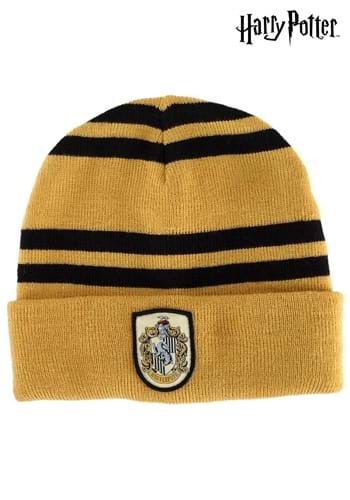 So, make sure when that letter does come in the mail and you head off to the famous School of Witchcraft and Wizardry, you bring this Hufflepuff Hat along. Then, when your name gets called up to the Sorting Hat, rather than wasting the time of Dumbledore and everyone else, you can respectfully tell them you already know where you belong. Once they see you already proudly representing team badger, they will kindly point you in the direction of your fellow Hufflepuffs. Of course, they may completely ignore your claim and your hat and have you still be placed by the Sorting Hat... but if you truly belong in Hufflepuff, then that's where you'll end up!